Mccardle, Bennett. "Frank Calder". The Canadian Encyclopedia, 21 March 2018, Historica Canada. https://www.thecanadianencyclopedia.ca/en/article/frank-calder. Accessed 18 April 2019. Frank Arthur Calder, OC, Nisga’a politician, chief, businessman (born 3 August 1915, Nass Harbour, BC; died 4 November 2006 in Victoria, BC). Frank Calder was the first Indigenous member of a Canadian legislature, elected in 1949 during the BC general election. Calder is best known for his role in the Nisga’a Tribal Council’s Supreme Court case against the province of British Columbia (commonly known as the Calder case), which demonstrated that Aboriginal title (i.e., ownership) to traditional lands exists in modern Canadian law. British Columbia cabinet minister Frank Calder talking to the media in Ottawa on 8 February 1973. Frank went to the Coqualeetza Residential School (see Residential Schools), Chilliwack High School, and later to the University of British Columbia (UBC), where he became the school’s first Status Indian student. Frank studied theology at the Anglican Theological College at UBC, and graduated in 1946. He worked in the fishing industry after graduation and even thought about being ordained. Ultimately, Frank decided to go into politics. He became the first Indigenous person elected to a Canadian legislature during the 1949 BC general election. It was shortly after his election that Calder began working towards reopening his people’s land claim dispute with the province. Frank Calder served as a British Columbia MLA, first with the CCF-NDP from 1949 to 1956 and from 1960 to 1975, and after 1975, with Social Credit. 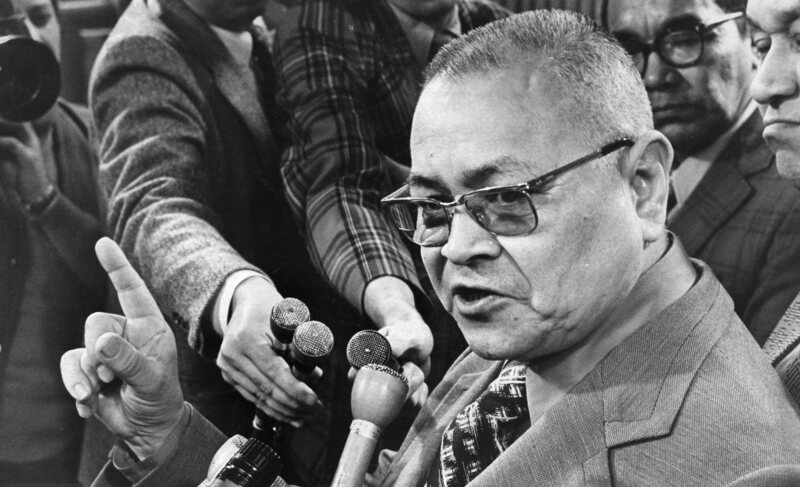 In 1972, he became the first Indigenous Cabinet minister, responsible for Indian Affairs. However, he was dismissed amid controversy in 1973. He was defeated in the 1979 election by one vote, but remained engaged in politics and Indigenous affairs well into his retirement. Calder was also active in Indigenous political organizations, and continued to be even after he was elected to provincial office. He was president of the North American Indian Brotherhood in 1944, organizer for the Native Brotherhood of BC, and a founder and president (1955-73) of the Nisga’a Tribal Council, the organization that went on to fight for recognition of Nisga’a title to their lands. Calder asked lawyer Thomas Berger to represent his people in a court case against the provincial government. In 1967, the Calder case (also known as Calder v. Attorney General of British Columbia) was launched, and went to trial two years later. Calder’s opposition to the reserve system and his views on the 1969 White Paper brought him into conflict with others in the First Nations movement. Calder generally opposed the reserve system because he compared it to apartheid. Calder strongly supported certain measures in the White Paper, such as abolishing Indian Status, dismantling the federal department of Indian Affairs and converting reserve land to private property. However, he did object to the way the White Paper was created — without input from Indigenous people. His staunch support of the White Paper cost him allies among chiefs as well as political influence in Victoria, as general sentiment turned against the White Paper (see Indigenous People: Government Policy). In the Calder case, the Nisga’a Tribal Council asked the Supreme Court of British Columbia to recognize that their title to lands in and around the Nass River Valley had “never been lawfully extinguished.”The case was dismissed at trial. The Nisga’a Tribal Council then took the case to the Court of Appeal of British Columbia, but that court dismissed it as well. The next course of action was to take their case to the Supreme Court of Canada. On 31 January 1973, the court released its judgement.Six out of seven judges ruled that Aboriginal title existed in Canadian law. However, six of the judges were split evenly on the validity of the Nisga’a claim: three argued that Nisga’a title had been extinguished by land laws made before BC entered Confederation; the other three disagreed, declaring that the right was never extinguished by statute or treaty, which is what the Nisga’a had argued. The seventh judge, Justice Pigeon, tipped the balance against the Nisga’a on a procedural point — that the Nisga’a had failed to obtain permission to sue the Government of British Columbia from the attorney general. Therefore, the Nisga’a lost based on a technicality, but the case served as a catalyst for change, concerning the recognition of Indigenous rights in Canadian law. The case also influenced future court cases about Indigenous rights, including R. v. Van der Peet (1996) and Delgamuukw v. British Columbia (1997). Shortly after the Calder decision, Prime Minister Pierre Elliott Trudeau met with Calder and other Nisga’a chiefs in Ottawa and acknowledged Aboriginal rights existed and a policy was needed. Later in 1973, the Government of Canada created a new comprehensive land claims policy, helping to facilitate the negotiation and claims process. In 1998 the Nisga’a land claim was signed. It was passed into law two years later. Calder was not involved in the negotiations and voted against the treaty during a referendum by the Nisga’a in late 1998. He opposed the amount of land transferred by the treaty as well the creation of a central Nisga’a government. The treaty was ratified by all levels of government and became law in 2000. In February 1975, Calder married Tamiki Koshibe, a Japanese immigrant. They had one son, Erick, in 1982. After defeat in the 1979 election, Calder stayed busy in retirement. Calder sat on various federal and provincial panels, worked as a university lecturer, was President Emeritus of the Nisga’a Tribal Council and stayed active in the organization. He also spent as much time as possible with his young son. He died of cancer in Victoria in November 2006. Calder is remembered as a great leader and politician, who not only helped his own nation to realize justice, but also set in motion the process by which the federal government came to recognize Aboriginal title in modern Canadian law. Hamar Foster, Heather Raven and Jeremy Webber, eds., Let Right Be Done: Aboriginal Title, the Calder Case, and the Future of Indigenous Rights (2007). Joan Harper, ed., He Moved a Mountain: The Life of Frank Calder and the Nisga’a Land Claims Accord (2013).